Barcelona skiing season starts in November 2013! The skiing season will be starting extra early this year in Andorra and the Pyrenees. After heavy snowfall in the Pyrenees in mid-November 2013 five ski resorts near Barcelona – Baqueira Beret, La Masella, La Molina, Vall de Núria y Vallter 2000 – plan to open partially as early as weekend starting Saturday 23rd November 2013 with between 40cm and 1m of snow. 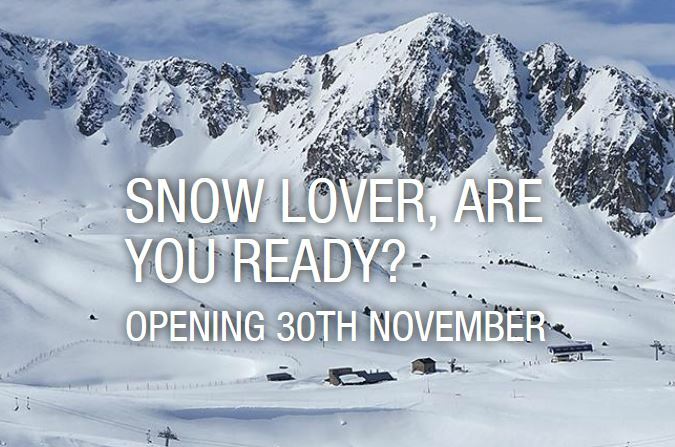 Andorra also planning to open in November on Saturday 29th November 2013. Visit their websites for more information of which lifts will be open. This means that the chances are very good that most ski resorts near Barcelona will be open for the Spanish holiday puente on December 6th to 8th 2013. This entry was posted in Andorra Day Tours, Day Tours Barcelona, Skiing near Barcelona, What to do in Barcelona and tagged andorra, grandvalira, masella, pyrenees mountains, ski barcelona, skiing, skiing near Barcelona, snow on November 17, 2013 by admin.